Over the past five years and more, the Belt and Road Initiative has greatly enhanced global trade liberalization and investment facilitation. At a time when the global free trade system is facing severe challenges, the Belt and Road Initiative has been given the mission of building a more open, inclusive, balanced and mutually beneficial mechanism in the economic globalization drive. Since its inception, the Belt and Road Initiative has always focused on multilateral cooperation. It is not a tool for a "geopolitical alliance", but rather an open economic platform that aims to maintain and improve the multilateral trading system through dialogue and co-construction. From a global perspective, it is urgent to defend the rule-based multilateral trading system and properly handle bilateral economic and trade relations within the multilateral system. The China-US trade frictions, for example, are having a more indirect multilateral effect than a direct bilateral impact. Therefore, we need to maintain close multilateral cooperation to advance the Belt and Road Initiative and to reform the World Trade Organization and speed up free trade agreement negotiations, such as those for the Regional Comprehensive Economic Partnership (RCEP), the China-Japan-South Korea Free Trade Zone and the China-EU Free Trade Zone. We also need to dock the Belt and Road Initiative with the Comprehensive Progressive Trans-Pacific Partnership in terms of funds, projects and markets. Both the new phase of economic globalization and China's economic transformation and upgrading require the construction of the Belt and Road to focus on building a multilevel free trade zone network. The Belt and Road Initiative offers many opportunities to construct an FTZ network which, in turn, could drive the initiative to embrace higher-quality development. In the next few years, the climate for globalization is likely to become more complex and unfavorable. An institutional guarantee will play as a stabilizer for the initiative, and in this sense, a high-level and diversified network of FTZs will serve as one such guarantee. As the Belt and Road Initiative is entering a new phase, the coordination of production capacity cooperation and service trade cooperation has become a major task. From 2010 to 2017, the global trade in services grew at an annual rate of 4.4 percent, twice that of the trade in goods; and its share in the total volume of global trade rose from 20 percent to about 24 percent. The rapid growth of trade in services also makes it the focus of negotiations on bilateral and multilateral trade and investment agreements, and where tensions and divergences always lie. The progress made in the construction of the Belt and Road shows that both infrastructure and international production capacity cooperation projects have generated huge demand not only for industrial and consumer goods, but also for service sectors such as finance and logistics. But in 2017, the service trade between China and the Belt and Road countries accounted for only 8.2 percent of the total trade volume, calling for further expansion of services cooperation. The integration of production capacity cooperation and services trade requires breaking the administrative monopoly in the domestic services sector, promoting its comprehensive opening up, and strengthening the protection of related intellectual property. Besides, to advance the Belt and Road Initiative as well as an FTZ network, it is important to align them with high-standard international economic and trade rules and create an international business environment based on the principle of competitive neutrality. At the same time, it is equally important to increase the proportion of the private economy in Belt and Road investment cooperation from the current 40 percent to more than 60 percent to make private enterprises an important part of the connectivity. A down-to-earth attitude is needed in the process of advancing the Belt and Road FTZ network with concrete steps. For example, the FTZs could be first established in countries with mature conditions, such as the member countries of Shanghai Cooperation Organization and 10 members of the Association of Southeast Asian Nations that have maintained close cooperation within the"10+1" framework. When conditions permit, free trade policies in the fields of tourism, healthcare, e-commerce and so on should be implemented. As the Belt and Road Initiative focuses on extensive cooperation in such fields as infrastructure, manufacturing, services, energy and resources, it is feasible to establish various forms of economic cooperation and implement free trade policies in the fields mentioned above. For example, we can build regional trade centers such as a "pan-South China Sea tourism cooperation circle" for cooperation between Hainan province and relevant island economies in tourism, health, culture and education. What's more, it is important to establish border economic cooperation zones at major dry and sea ports, and build a number of cross-border economic cooperation zones at key nodes of Belt and Road FTZ network. 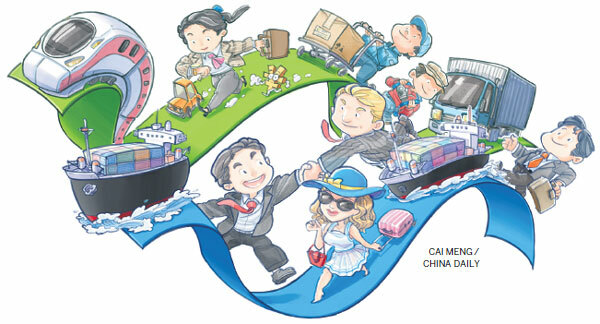 Qualified cross-border economic cooperation zones could also be upgraded to bilateral FTZs.